1. We start from your Outlook inbox. Click on File in the left corner and afterwards on InLoox PM options. 2. The InLoox PM options will open in a separate window. In this window select Notifications >> Templates in the tree structure on the left, to get to the notification template overview. 3. 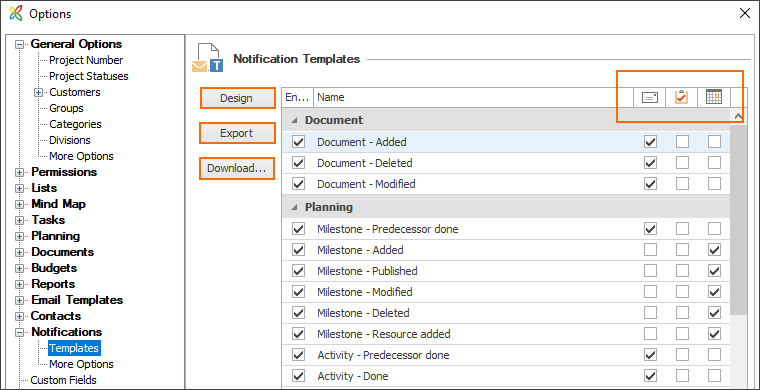 In the overview you can see all notification templates structured into tasks, documents and planning. Additionally, you can define the notification type for each template by using the three icons on the right side (see screenshot). When you have finished, save your changes by clicking on Apply in the InLoox options. To save a notification template locally on your computer, select the template from the overview and click on Export. Afterwards select the storage place in the new window and click on Save. When you have finished, save your changes by clicking on Apply in the InLoox options. To download notification templates from the InLoox website, click on Download. You will we transferred to the InLoox website, where you select the language (German/English) for your notification templates. Introduction to notification templates • Copyright 1999-2019 © InLoox, Inc. All rights reserved.